· Boil toor dal and channa dal in a pressure cooker with salt and turmeric powder till it is thunder. · Clean, wash and chopped spinach. · Now heat a pan with oil and add cumin seed, cardamom and cinnamon. · When you get good aroma of all these above mentioned. · Put chopped onion in this and fry till it turns to golden brown colour. · Once onion is done and adds chopped tomato with tomato puree. · Add all dry masala including salt. · Fry all these for 5 minutes. · Add chopped spinach and cook till it is thunder by coving pan lid. · Put cooked Dal in this and mix it properly. · Cook till one or two boil comes. · Serve hot with anything you want. Lovely dhal and guess the addition of tomato paste gives a nice colour to it. With a bowl of rice, can have this dal even everyday. Wow, the photograph looks fabulous. I love the dals that I've made. Don't usually mix more than one legume when I do it but will surely try this. I like to put a small mound of rice in the bowl and then add the cooked dal. 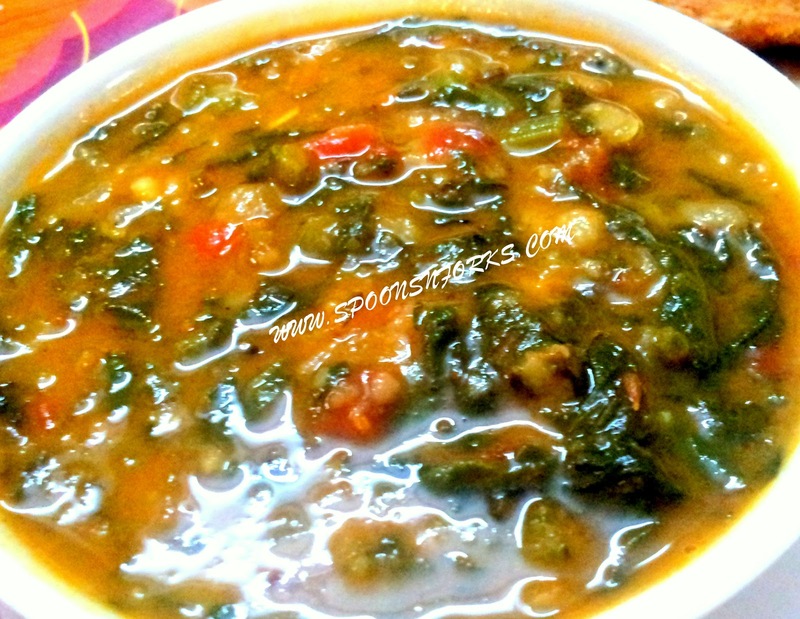 delicious and awesome finger licking spinach dal. great recipe, I absolutely love spinach dal.. my husband's favorite type of dal. i make it quite often, yours looks lovely. Such a delicious dal! Love it with spinach!